Fred Hobby joined the Institute for Diversity in Health Management (Institute) as president and CEO in 2005 with more than 25 years of hospital experience in three states and six systems. Fred Hobby will lead the Institute into its second decade of service, developing tools and resources to enhance diversity in our nation’s hospitals, and helping health care organizations with diversity activities. 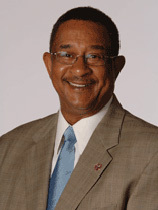 Fred Hobby began his hospital administration career with Humana, Inc. in Louisville, KY after serving 4 years as the Executive of the City’s Affirmative Action Department and 3 years on the faculty of the University of Louisville. Before joining the Institute, Fred spent 10 years with the Greenville (SC) Hospital System (GHS), a 1,086-bed acute care teaching hospital system. As vice president and chief diversity officer at GHS, he developed and implemented a system-wide diversity initiative that is nationally recognized for its comprehensiveness and success. Its components include diversity training and cultural competence education for the system’s 7,200 employees as well as an extensive language interpretation department to better serve patients who speak a language other than English. The GHS Language Center was the first recipient of a letter from OCR recognizing its’ compliance with the Federal LEP Guidelines. Fred Hobby received a bachelor’s degree in history and political science from Kentucky State University in Frankfort, KY, and a master’s degree in sociology from Washington University in St. Louis. Prior to joining GHS, Fred served as a clinical administrator with Portsmouth (VA) General Hospital and is a former CEO of the Newport News General Hospital. He is a frequent guest speaker on diversity and has been featured at a number of prestigious national conferences. In 1999, Fred Hobby was named “Senior Executive of the Year” by the National Association for Health Services Executives. Fred was named to Modern Healthcare Magazine’s 100 Most Powerful People in Healthcare in August, 2006 and again in 2007. Fred was the cover story in the 2006 Winter issue of HR Pulse, the official publication of the American Society for Healthcare Human Administration. Fred currently serves on the National Board of the Certification Commission for Healthcare Interpreters (CCHI). He was selected to represent the interest of hospitals and has served since its inception. Fred is a member of the CCHI Executive Committee. In 2010, Fred Hobby was selected as a content expert to serve on the National Project Advisory Committee (NPAC) of the CLAS Standards Enhancement Initiative. The NPAC was created by the Dept. of Health, Office of Minority Health to modify current standards or create new ones to advance equity in the health care delivery system. Fred is married to Patricia King-Hobby and they have three children: twins, Brian and Ryan and daughter, Ashley.